Infowars personality and conspiracy show host Alex Jones has been engaged in a custody dispute with his ex-wife, Kelly Jones, since their divorce in 2005. The couple had three children, ages 9, 12, and 14. 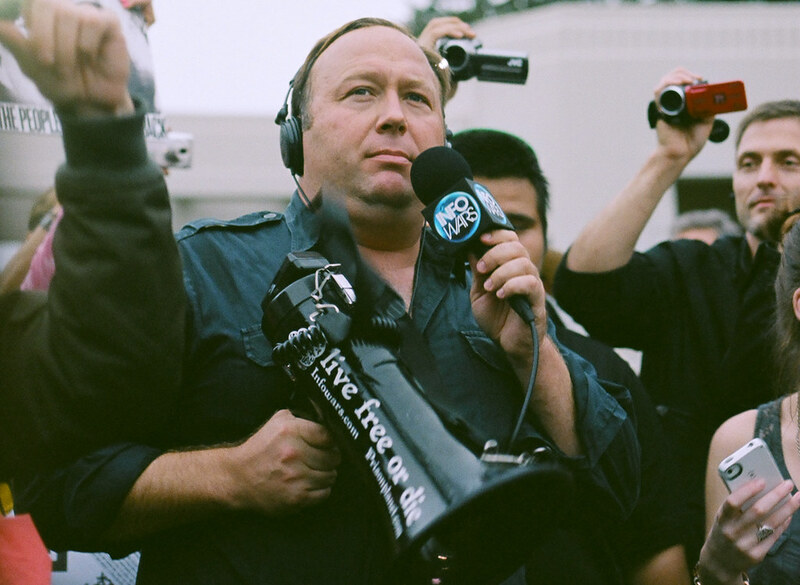 Jones is famous for his angry rants on air, during which he talks about topics such as “9/11 is an inside job” or “Sandy Hook is a hoax.” Jones gained prominence last year when Mr. Trump appeared on his show. At the end of April 2017, the jury awarded the couple joint custody of their children, but with the children’s primary residence changed to their mother’s residence. The ruling was made after almost two years of restraining orders, protective orders, subpoenas, and depositions. Mr. Jones’s show has been a drag on his custody battle. Ms. Jones’s attorneys have used video tape evidence of Mr. Jones’s rants as evidence that he is mentally unfit to be a parent. They compare Alex Jones to cult leaders and that the children are being turned into cult followers. The father’s attorneys argued to the jury that their client was merely a “performance artist” and that the videos were merely an act. Unfortunately, Mr. Jones himself never got the memo that his show was merely “satire.” In another video filmed after his attorney’s opening arguments, Mr. Jones proudly announced “I 110 percent believe what I stand for.” A psychologist testified that Mr. Jones was diagnosed with narcissistic personality disorder, a disorder in which the patient has an inflated ego and has a constant need to be admired and a lack of empathy for others. Should Parents With Mental Disabilities Retain Custody of their Children? The most interesting issue here, assuming that Alex Jones is not acting, is whether Mr. Jones has narcissistic personality disorderand whether that narcissism would prevent him from properly raising his children. Custody cases are always to be decided in the children’s best interests. This is the standard in all custody cases and attorneys should always be arguing that time with their client is in the children’s best interests. However, for many years society has made many assumptions about what is best for the children. These assumptions can be unconstitutional if they violate a constitutional right. For instance, firearms can be dangerous to children, but merely owning a gun cannot be said to violate a child’s best interest. Similarly, assumptions about race, religion and gender must often be challenged. Disorders and disabilities are more difficult for a court to assess. On one hand, having a parent with a disorder or disability might inhibit a parent from being fully able to raise a child. On the other hand, merely assuming a parent is an unfit parent because of a disability would not be valid. For instance, a parent who is wheel-chair bound might not be able to engage in physical sports or run up a staircase to chase a little boy. However, the opposing party must offer proof that the parent’s wheelchair is actually preventing the parent from carrying out his or her parental responsibilities and not just assume that the disability is inhibiting a parent-child relationship. If Alex Jones has narcissistic personality disorder, the question is whether Mr. Jones’s disorder is causing harm to his children. From the trial testimony, it sounds like Mr. Jones’s issue is that he requires a constant need to be right, even if that need results in him sabotaging his legal fight for his children. Such a personality could be overly dominating, especially for young children. The question for the jury is whether a dominating personality is merely a strict father who wants the best for his children or a man who wants his children to tell him he is right and correct in all things. If it’s the latter, Mr. Jones should not have custody. So what lessons can we draw from Mr. Jones’s case? First, do not sabotage your attorney, especially if the other side is arguing that you’re insane. Contradicting your attorney is never a good idea, as the opposing side can use your own words against you and your legal team. Second, provide as much evidence as possible. Walking into an attorney’s office and complaining about how crazy your ex-spouse behaves is not nearly as effective as walking into an attorney’s office with witnesses, police reports, or video tape of how crazy your ex-spouse behaves. Of course, not every ex-spouse runs an internet show out of his or her house, but if the behavior is truly that terrible, it might be worth calling the police to get a report.